W.D. 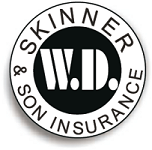 Skinner & Son Insurance Agency, Inc.
Business Name: W.D. Skinner & Son Insurance Agency, Inc.
Skinner Insurance Agency, located in Barnesville, Ohio, has been serving customers throughout the Ohio Valley since 1935. We take pride in providing Professional Insurance and Financial Solutions to our customers with an up-front, honest and down home approach. We strive to find you the best coverage for your hard earned money without sacrificing what you need most, fair and prompt claims service. Listing Title: W.D. Skinner & Son Insurance Agency, Inc.